Tonight anther new and riveting episode of CHICAGO P.D. airs. In “The Docks,” Voight and Platt share information about their pasts; Jin is caught poking around on Voight’s computer and shifts blame to a convenient scapegoat; Lindsay realizes that she needs to be honest with Charlie; and Halstead gets the answers he’s been seeking. On last week’s episode a dangerous cartel leader was at large and intelligence had to rely on Pulp to track him down – Commander Perry (guest star Robert Ray Wisdom) notified the Intelligence unit that Pulpo (guest star Arturo Del Puerto) had been released to help track down a dangerous cartel leader. This doesn’t sit well with our team as he kidnapped one of their own and no love was lost between sides. Meanwhile, Ruzek (Patrick John Flueger) got some difficult news as a blast from Lindsay’s (Sophia Bush) past came back, giving us a glimpse at where she came from. Voight (Jason Beghe) reminded her that she came too far to screw it up. At the same time we learned something about Jin (Archie Kao) that was bound to be a problem. Jon Seda, Jesse Lee Soffer, Elias Koteas, Marina Squerciati, and LaRoyce Hawkins also star. Amy Morton, Kurt Naebig, Ian Bohen, Sydney Tamiia Poitier and Billy Wirth guest star. Did you watch last week’s episode? If you missed it we have a full and detailed recap, right here for you. On tonight’s episode the men and women of district 21 confront past demons and look to the future as the manhunt for Pulpo unfolds as Antonio’s (Jon Seda) life is now in question, Voight (Jason Beghe) and Platt (guest star Amy Morton) open up about their pasts. Jin (Archie Kao) is caught while tinkering with Voight’s computer and uses the only scapegoat possible to keep him in the clear. At the same time with Charlie (guest star Billy Wirth) back in town Lindsay (Sophia Bush) realizes she’s going to have to come clean about a few things. Halstead (Jesse Lee Soffer) finally gets answers he’s been wanting about Voight’s and Olinsky’s (Elias Koteas) past. Patrick John Flueger, LaRoyce Hawkins and Marina Squerciati also star. Tonight’s episode looks like it is going to be great and you won’t want to miss it, so be sure to tune in for our live coverage of NBC’s Chicago PD at 10:00 PM EST! While you wait for our recap hit the comments and let us know what you think of Chicago PD, so far? Check out the sneak peek of tonight’s episode below! Tonight’s episode begins with Voight and Lindsay at the hospital to see Antonio. His wife is there as well. Antonio can barely speak but mumbles, “Get him.” Voight, of course, vows to do just that. He sees Antonio’s family arrive and reassures them. He puts Burgess and Atwater in charge of protecting Antonio’s family while they are at the hospital and Voight heads out with a mission. Back at the station, Jon gets caught going through Voight’s desk in order to get more dirt on him. He plays it off and is able to pass off his snooping as some computer work. Voight meets with his team about tracking down Pulpo and tells them all that he intends to be as dirty as he has to to get his guy. Jin awaits another dreaded meeting with Stillwell and hands over the little information he has. Stillwell is not impressed and tells him that unless he brings something more substantial to the table, his father will be getting s visit from the FBI. Ruzek recruits a Spanish-speaking officer to call in a bomb threat after Ruzek remembers how a bomb threat was called in to his father when he and Ruzek’s mom were going through a divorce. He said his father was looking under his car for weeks. Voight and Ruzek pay a visit to Pulpo’s attorney. The attorney starts giving up some information on his client hoping that he is caught since he is not happy with his attorney who is now fearing for his life. Halstead and Olinsky get a call from Voight with the information on a lead from the attorney. Pulpo wanted new ID’s for him and his family and this guy was supposed to help. The guys find their way back to the area where the guy did the photos for them and they see that the woman must have cut her hair. He doesn’t want to cooperate until he sees Olinsky’s gun. He starts talking and tells the guys what he made for them and what he knows. Charlie pays another visit to Lindsay. She shares with him that he has a son with his ex who he left. He is surprised by the news. Back inside, Jin shares the good news that they know where Pulpo is because they just used their ID’s. As the team rushes off to catch up to them, Voight tells Sumner she is not included because she is officially off his team and is transferred. Everyone is shocked, but they need to get out of there. They catch up with the van and, guns drawn, approach it with caution. They get the boy out of the car and see the girlfriend coming out of the store. 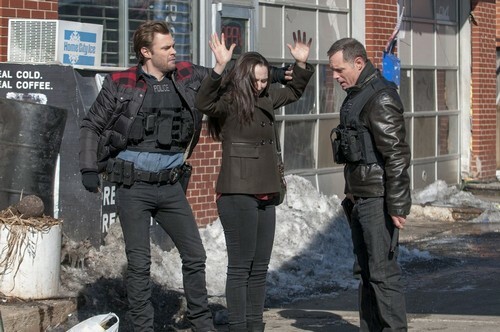 They nab her and Voight gets in her face demanding to know where Pulpo is. Voight realizes after the girlfriend is questioned, that Pulpo used her as a distraction. Looking through paperwork back at the station, Lindsay sees that someone tried to bond Pulpo out. They track another lead to a bar and head over immediately. They come in armed and ready to take everyone in. They get the owner and confiscate his computer. Jin gets all the emails pulled up but they are in Russian. Voight tells Jin he knows someone to translate. They find paperwork s=for a shipment of two SUV’s from the US to Russia. They go back and question the bar owner who gives them enough detail to track the shipment. They get to the truck, make the driver follow them. They get the driver out and head to the back with their guns drawn. They open the back and throw in an explosive that will force anyone out. It worked and they see Pulpo crawling out of the back of an SUV. Voight throws him in the trunk of their car and he and Olinsky take off. As Voight and Olinsky are binding Pulpo’s mouth and throwing in a few good punches, Halstead heads to the hospital to check on Antonio and let him know about Pulpo. Antonio tells Halstead about the docks and shares that is the location where they took browning after he killed Olinsky’s partner. Voight tells Olinsky that this is payback for killing their man. They have Pulpo at the docks and are putting a weight on him as his mouth is taped shut. Just then, Halstead shows up. They argue over doing the right thing…they just need to figure out what that is because they both have different opinions on that. Olinsky was already conflicted and now that Halstead showed up, he seems to have made a decision as well. They bring him in to the station and Voight just goes straight inside, obviously pissed off about the whole thing. Burgess and Atwater are both up for Sumner’s old position and Voight shares a congratulations with Atwater. Burgess asks why she didn’t get selected and Voight tells her that her office romance played a big part in his decision. She hold her head high as she walks out but she is crushed. She sees Ruzek on her way out. Olinsky vows to make things right with his ex. Meanwhile, Charlie meets his son for the first time with Lindsay as a mediator. He takes off after a moment and forces Lindsay to answer after he repeatedly asks her if she owes him. She finally replies yes, and he takes off. Voight has a heart to heart with Halstead about his reasoning for doing what he does. He gives some insight as to why he is the way he is. There are no apologies, though. They take a drink together and Voight visits his father’s memorial after. Next week is going to be really exciting as Charlie’s storyline heats up!